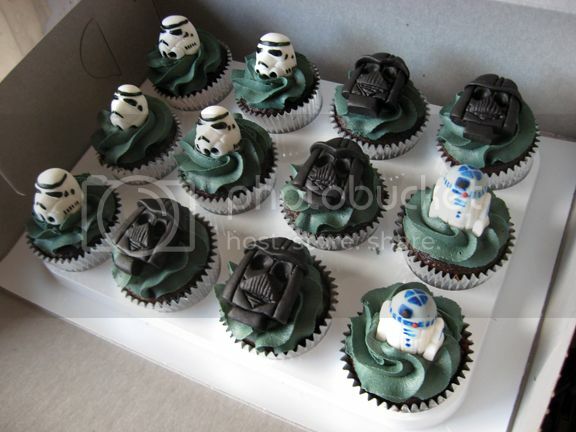 Liz M. of Artisan Cake Company in Keizer, Oregon, sent me the deets on these delightful Star Wars cupcakes she made for some kid who definitely didn’t share these with me. ‘Cause I would have remembered that. 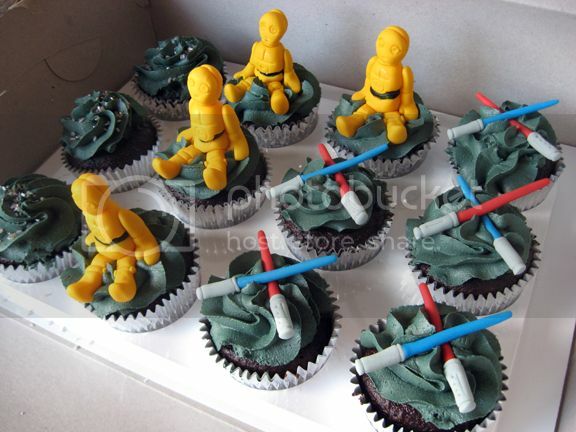 Yeah, out of the lightsabers, Stormtrooper helmets, Darth Vader helmet,s and little R2-D2s, I like the C-3PO cupcakes, best, too. But mostly because I like my food to look anthropomorphic, so that when I’m eating it I can pretend I’m a rancor beast. Or Marlon Brando. Because he looks like he eats people. Or he has. At some point. Someone told me something awful yesterday, which is that kids these days much prefer episodes 1-3 to 4-6. These cupcakes give me hope that childhood isn’t completely lost. Nickolai – I blame the parents for not showing the movies in the correct order, 4-6 then 1-3. That, and not giving the kid a plush Wicket as a baby and buying a Lego Millennium Falcon. Shame on those awful, awful parents. My son just had his 7th bday and we had to settle for the generic chain store Star Wars cake. These are much more awesome. Wish we could have had these. I would like more snarkiness with my cupcakes, please, GWS.